Save 10% off MSRP for the month of April! Product Description: Our formula is made from 99.5% natural ingredients, from plants and minerals. Non-scratching. 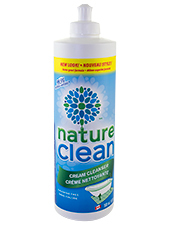 Removes tough stains, soap scum and mildew. For use on bathtubs, sinks, tiles, countertops, refrigerators, stoves, chrome, steel fixtures, smooth stovetops and more! Warnings: May irritate eyes. Do not get into eyes. Keep out of reach of children. First Aid Treatment: Contains: Nepheline Syenite, Sodium Bicarbonate, Glycerin, Decyl Glucoside and Alcohol Denature. If swallowed, seek medical attention immediately. Do not induce vomiting. If in eyes, rinse with water for 15 minutes. Additional Info: All ingredients are readily biodegradable as per OECD Test #301D. Not tested on animals. Ingredients: Water, Nepheline Syenite, Sodium Bicarbonate, Glycerin, Decyl Glucoside, Alcohol Denat, Magnesium Aluminim Silicate, Cocamidopropyl Betaine, Xanthan Gum, Potassium Sorbate, Sodium Chloride, Denatonium Benzoate. Suggested Use: Shake well. Apply directly to the surface or onto a damp sponge. Rub surface gently, rinse and wipe clean. Test first in a hidden area, especially on surfaces such as painted enamel, glass, ceramic, aluminum, fiberglass, plastic, etc.